Mialma is responsible for Winsome’s matcha conchas. Matcha is one of my favorite things in life. But in a concha? I mean, what about tradition? Conchas are symbolic of my childhood, and tied to so many sweet memories. But I drove to Echo Park one early Friday morning with an empty stomach and an open mind, eager to explore the classic bakeries of East L.A., the city’s epicenter of pan dulce. Our first stop was La Mascota in Boyle Heights. Bright and cheery, the bakery has served the community for over six decades and feels more like a modern café than an old school panadería. Though not lacking in traditional pastries, there wasn’t one beat-up metal tray in sight. The extensive menu includes everything from omelettes and sandwiches to salads and tamales. “When I first started coming here it didn’t look like this. You need a younger generation to see the value in keeping the tradition alive,” Mialma says. The introduction of European crops was a natural step in the conquest of America, and wheat was one of the first foods introduced into Mexico. In 1525 by ordinance of conqueror Hernán Cortés, bread was sold in public squares at fixed prices. Although the native population found the taste of wheat bland and preferred their homegrown corn, they were forced to eat it. In fact, wheat and wheat flour were sometimes used as payment in lieu of actual currency. But during the mid-1500s, a Spanish viceroy dipped his bread into hot chocolate in front of a crowd of people. A shift ensued and a new habit was born. By the seventeenth century, Mexicans had developed a taste for crispy baguettes and sweet pastries, as French bakers began migrating to the country and opening bakeries. Under Mexico’s brief French occupation in the nineteenth century, the country was inundated with these bakeries. Although most were Spanish or French owned, ninety percent of the bakers were native artisans who developed innovative and unique pastries based on European trends. The concha is a variation of a French brioche. The Austrian vanillekipferl, favored by Emperor Maximilian, became the polvoron, or wedding cookie. In the early twentieth century, British entrepreneurs worked in the country’s oil industry and cookies made with piloncillo (unrefined sugar), cinnamon, ginger, and anise became known as chichimbres, a derivation of the word “gingerbread.” And, well, croissants really do look like giant mustaches. There are nearly two thousand variations of Mexican pan dulce in Mexico. All were traditionally made with lard (pork fat was readily available and an appropriate substitute for butter). Our second stop is Mialma’s favorite: the family-owned La Favorita, also found in Boyle Heights. In business since the seventies, Greek statues replace Mexican folk art as decor. Their conchas are crumbly and airy, and the chocolate topping is especially rich. It’s easy to see why these were Mialma’s favoritas. She remembers being introduced to conchas by her husband, a fellow chef from Morelos, Mexico. “They were light and fluffy, crunchy and friendly,” she says. Today, they’re a staple in her home, and her children love them. Open since the 1960s, La Fama Bakery in East L.A. is next on the list. There are claims that people travel from all corners of the city to buy their conchas here, where coconut conchas comfortably snuggle next to the familiar vanilla and chocolate staples. La Fama also has an entire section devoted to whole wheat breads suitable for diabetics. Next up is Celaya, a stone’s throw from Winsome—the smallest and coziest of all. In addition to the usual pan dulces, the Echo Park institution serves donuts, danishes and a varied selection of meat and vegetarian tamales. Looking out the window with a traditional vanilla concha in hand, one has a view of long time residents mingling with young hipsters. Finally on our way to Winsome, Mialma explains the contrast between the conchas we’ve tasted and the ones she serves. “I use one hundred percent butter,” she says. It’s common to use shortening as a cost saving measure in many bakeries. Mialma may not have grown up with a heritage tied to concha-making, but she has spent countless hours making brioche in pastry kitchens of esteemed L.A. restaurants, including Providence and Republique. It bothered her that Mexican pan dulce wasn’t given the same respect as pastries from France or other European countries. “I wanted to show everyone just how good they can be,” she tells me. And Winsome has proven to be the place for her to do just that. The matcha component was inspired by the restaurant’s prominently Latino neighborhood, as well as its proximity to Little Tokyo and Chinatown. Mialma’s husband was her taste-tester while developing her recipe. “I knew I wanted to use brioche and incorporate matcha into the dough,” she says. Her husband would give suggestions, helping her tweak sweetness and sugar levels, until they agreed they’d landed on the perfect balance. Her triumph was arriving at a shortbread-like cookie crust she felt was just right. The crust consists of sugar, butter, matcha and flour, which she rolls, flattens and gently tucks into the brioche “like babies.” Quietly observing that careful tucking in a cramped and busy restaurant kitchen is a tender sight. Mialma says they still encounter guests who are unfamiliar with the concha, but the Asian population has been especially interested. “There’s something that’s called melonpan in Japan that looks like a concha,” she tells me. Despite being worlds apart, the two pastries are eerily similar. 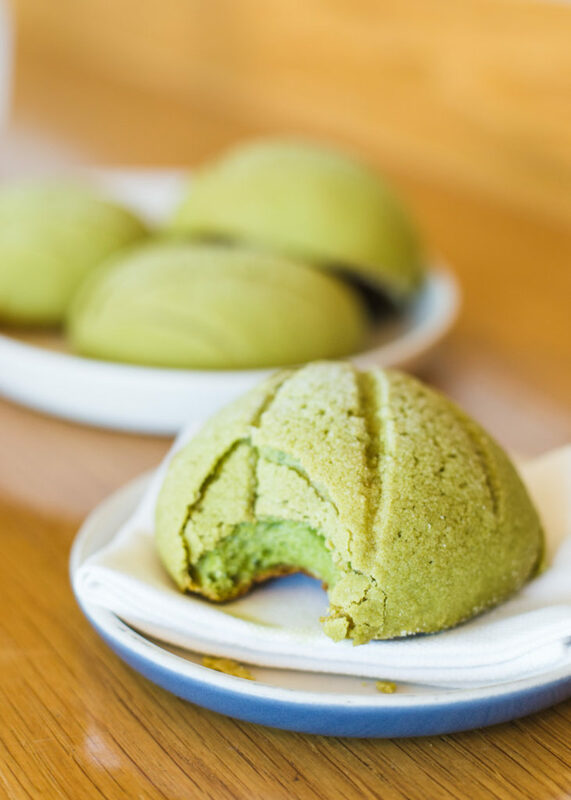 Although its origins are debatable, the melonpan’s cookie crust resembles a melon rather than a shell. The final product takes my breath away. It’s soft and fragrant, buttery and airy, and not too sweet; and its topping is crunchy and crumbly. One of my father’s favorite treats was a fresh concha, and in that brief moment he was sitting beside me in Echo Park. His mother—a baker—introduced exotic breads from the Yucatan to the then-dusty borderlands of Nuevo Laredo, proof that there’s always room for the old and the new. A lover of history and tradition, my father would have unraveled the storied layers in Winsome’s matcha conchas while dunking each cloudlike bite into his hot chocolate. Food is constantly touched by circumstance and place. Our cuisines evolve. Our menus are never static. Although Mialma is confident that old school panaderías are here to stay, she will continue making variations of pan dulce to introduce to a new, changing demographic. She has made it her mission to exalt Mexican pastries, one pound of butter at a time. “Food is a gateway to cultures,” she says. And, I might add, an open door for memories.